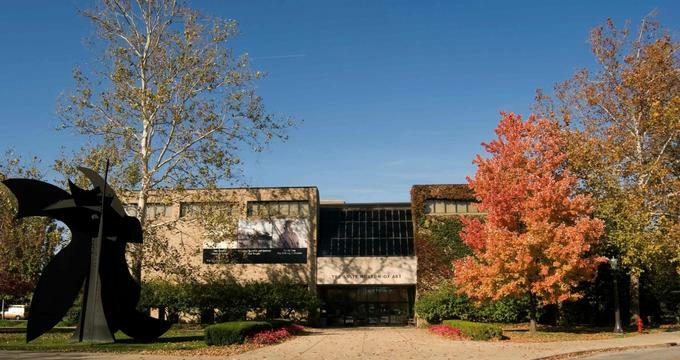 Considered by many to be one of the finest university art museums in the country, the Snite Museum of Art is located in Notre Dame, Indiana. The 28,000 works contained within the museum allow both students and visitors alike to view artworks from all corners of the world. One of the strengths of the institution is its collection of Native American, Latino, African, and African American art. In addition, the museum strives to explore the confluence between western colonial Catholic traditions and the cultures it has come into contact with throughout history. The Snite got its start on the university campus back in 1874, when Notre Dame hired Luigi Gregori to both instruct and create art for the university, which was then displayed in its main hall. Over the years, as more artifacts and art objects were acquired by or donated to the university, they came to be displayed in the four large galleries constructed on top of Bond Hall. Later, in 1953, the O’Shaughnessy Art Gallery was created to house the ever-growing collection of the museum. In 1974, due to the efforts of Rev. Anthony J. Lauck, the museum was accredited by the American Association of Museums. Two years following that achievement, the museum received a generous donation of $2 million dollars from a local businessman named Frederick B. Snite. It was these funds that lead to the construction of the site visitors see today. Many are unaware that is named after the son of this generous donor, Frederick B. Snite Jr. A Notre Dame graduate, this young man had contracted polio while on a trip abroad. Although he was able to live a fairly normal and accomplished life for almost two decades after contracting the disease, it eventually claimed his life. The majority of the museum’s African collection comes from Nigeria and as well as the two countries now known as the Democratic Republic of the Congo and Republic of the Congo. The artifacts reveal much about the spirituality and customs that informed those cultures in the 19th and 20th centuries. The museum is in the process of acquiring a larger African art collection from Owen D. Mort Jr. The 1,000 works of art that comprise this collection reflect the complex spiritual and social landscapes of the people who made them. Visitors will be able to see royal costumes, weaponry, masks, and carvings that originate from the Democratic Republic of Congo, which was previously known as Zaire. To fully understand the development of American society, one needs to first acknowledge and understand the Native Americans, who occupied the continent long before the arrival of the first European settlers. To this end, Notre Dame University has put together a rather comprehensive collection of Native American art, from both pre and post-contact societies. While many regions of the continent are represented, a particular strength of the collection is the art of the Plains Native Americans. In addition, visitors will likely be dazzled by the rarely seen ceramic art from the prehistoric era Anasazi and Mimbres cultures of the American Southwest. Modern art presents unique challenges to viewers. It is often misunderstood as pretentious due to its deflection from traditional forms and cultural signifiers. While it’s many manifestations make it almost impossible to state any overarching themes within modern art, taken as whole is requires viewers to bring something of their own experience into interpreting any given work. Modern art is largely informed by the social, political, and scientific advancements that have shaped the modern era. In this way, it is rather context-dependent. The modern and contemporary art collections at the Snite give visitors this much-needed interpretative framework for understanding the innovations that the sculptural, graphic, and photographic work on display requires of them. Visitors can view and contemplate works by artists such as Joan Miro, Sean Scully, George Rickey, and many more. Continuing in the Snite tradition of honoring celebrated artists who also taught at Notre Dame University, the museum has an impressive collection of works by Ivan Mestrovic. This Croatian artist exhibits a unique blend of modern and antique. Through his sculptures, visitors will be better equipped to see the links between the conservative artistic tendencies of the 19th century and the forward-thinking creative impulses of the 20th.